People like to dream of living out in the country. "Just me a cabin in the woods," they say. I live in ranching country though. I know what this really means. Out of town- It means bad roads in the winter and unpaved roads all year long. It means a bus ride as long as the school day for kids and no such thing as "a quick run to the grocery store." Let's be real here- for me, it means internet service that is not so great and not just popping into the library unexpectedly. For some people it's the life, though I know I couldn't do it. But here? Out among the mountains and clouds and quiet? I almost think I could. 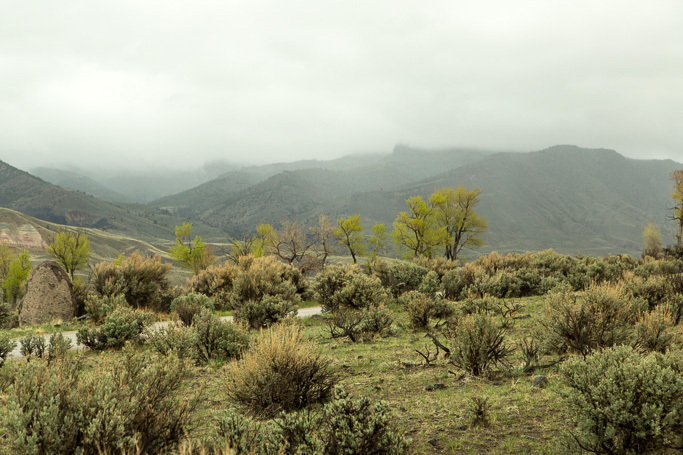 We drove out to go to just such a home- a ranch out in the Shoshone National Forest. To get there we travelled down the South Fork (For some unexplainable reason, we've really not been utilizing the South Fork to the blog's greatest potential, but after this photo shoot, that will surely change!) We went to a supper thrown in connection with The Boy's job. I got to meet the people he works with and we all ate good food and enjoyed the lovely (if rainy) sites. It was one of those "oh yeah, we're a couple!" moments getting to be introduced to the coworkers and all. Speaking of rain (and who doesn't want to listen/read to me drone on about the weather? ), it necessitated another last-minute-thrown-together outfit. We never get rain. Unsure of how to cope, I dug The Boy's mustard cardigan out of the closet and claimed it as my own. The tied-off shirt showed a bit more midriff than originally intended, but paired together with the cardigan, rolled jeans. and go-everywhere flats, it worked great. A vintage necklace kept the look tomboy-but-girlish, and I was ready to rock (dress at the dinner was casual in case you were all wondering I was horribly underdressed). So, what do you think? These mountains making you wish for a cottage in the wilderness? Hehe...I live on the side of a mountain at a lake - but it's in a development so I can't say that really counts for being so remote as this :-) I do love the nature aspect of it though! Gotta say, I love this outfit Kristian. You make casual look so cool and stylish - something I feel like I need to take a lesson at doing. Really beautiful photos too! I love all the nature in your photos. You live in such a pretty place. Also, your comment about making the casual look nice really means a lot as that is something I've been working towards!THank you. We visited a place like a dude ranch. I can see why people would want to vacation at such a place for sure! A he wore/she wore is a great idea! Thanks Jen! 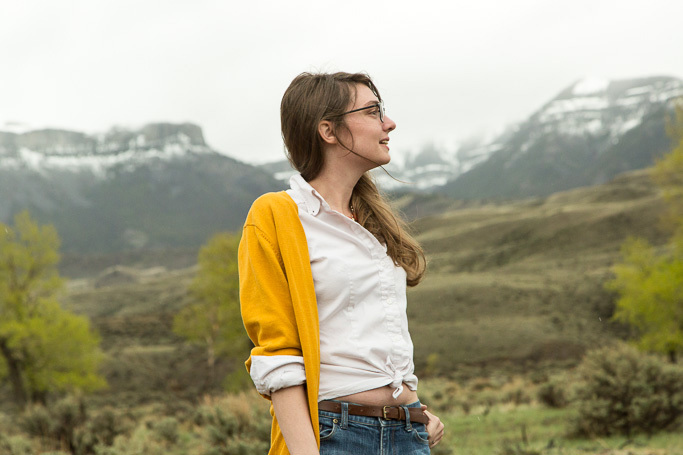 These pictures are so wonderful, definitely makes me want to hit the road and go hang out in a cabin in the woods. So stunning!! And i love that you borrowed his cardigan, it looks pretty amazing on you. Such a wonderful colour! Cute! 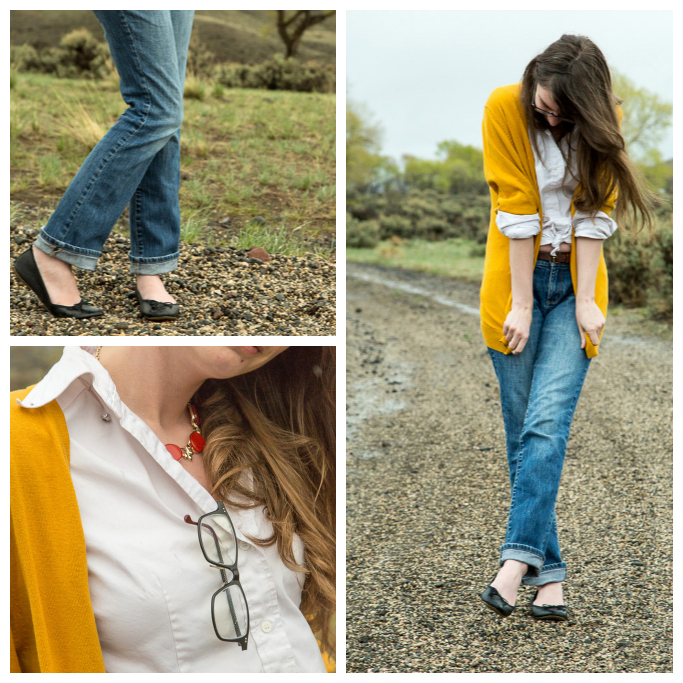 Your boy must be pretty stylish-I could never see my hubby in a mustard cardigan! Your backdrops here are stunning. I always wish I lived more out in the middle of nowhere. I'd rather look at fields and mountains than buildings any day! Sounds like a fun dinner and I'm sure you made a great impression! Not sure I'd call Amos stylish- but he wants to be! He had me help him buy a bunch of clothes..."oddly" he doesn't wear them often (to be fair, they were H&M and knowing him he ripped them up and wore them out pretty quick). I chose the cardigan for him, lol. yes! You look sweet in a beautiful setting. wow, that nature is gorgeous! So green and lush and beautiful yet so different from typical green pine forests of our greenery up in northern AZ. your pictures are amazing and I like your casual look w/ the big cardi, good pick of your man, mine would never own something so cute haha. and I know what you mean about rural life like that, one of the many reasons my parents moved from farms in Nebraska, but one cool thing is my dad rode his horse to school! although his nearest neighbor was maybe 5 miles away it wasn't too bad. We were plenty shocked by the green and lush-ness! It NEVER rains. I seriously didn't know that the sagebrush could turn that color. Normally we resemble AZ nature a lot more. Which is pretty too, but very different; you're right! Ha! Love that your dad rode his horse to school. The FFA did that at my high school, but only on FFA day. i love your sweater! This scenery is amazing! I love that you're wearing your soon to be husband's cardigan. Kevin is just a size few sizes bigger than me (skinny and tall, so so jealous!) so I often wear his cardigans and jackets. I think it looks cute! Now I want to see you in one of those borrowed items; bet it does look so cute! What a cozy looking cardigan! What an amazing experience to spend that time in Mexico like that! What brought you out to that area? The scenery looks beautiful, and you look great in your boyfriend's clothes! When I visited out west I was amazed at how little of everything was around! I mean, like all nature and no wal marts. haha. It's refreshing and beautiful, but I probably am not suited for it, either! You really do live in such a beautiful place! I don't think I could ever live in the wilderness, but it sure is gorgeous. And I think you need to steal your man's cardigan. It looks great on you! Super cute! I love the outfit and the layout of your photos! Lets follow each other? I would love to live somewhere peaceful without the hussle and bussle I think it would be great for some time out. Loving your "boyfriend" inspired look! Oh my goodness, that cardigan - so beautiful! I love how you styled it too, comfy and casual, but a little bit preppie. So cute! cuteeee. i really dig your style. 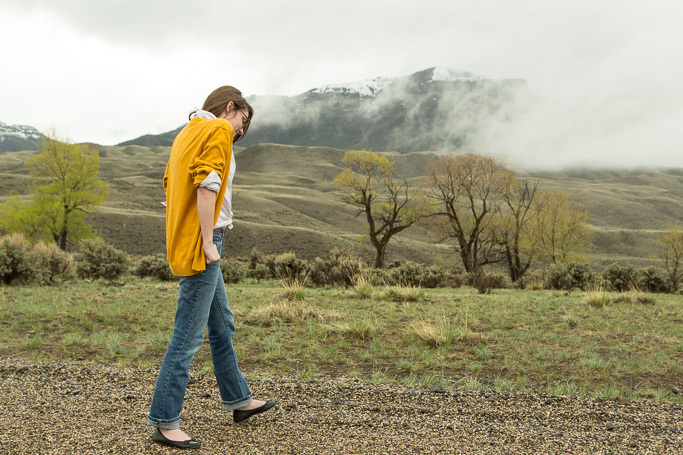 wow, amazing photos, love the spring prairie and the gold cardigan. you are adorable! !